Critics of heteronormative attitudes, such as Cathy J. Cohen, Michael Warner, and Lauren Berlant, argue that they are oppressive, stigmatizing, marginalizing of perceived deviant forms of sexuality and gender, and make self-expression more difficult when that expression does not conform to the norm. This includes lesbian, gay, bisexual, intersex, transgender (LGBTQ) people, as well as others such as racial minorities. 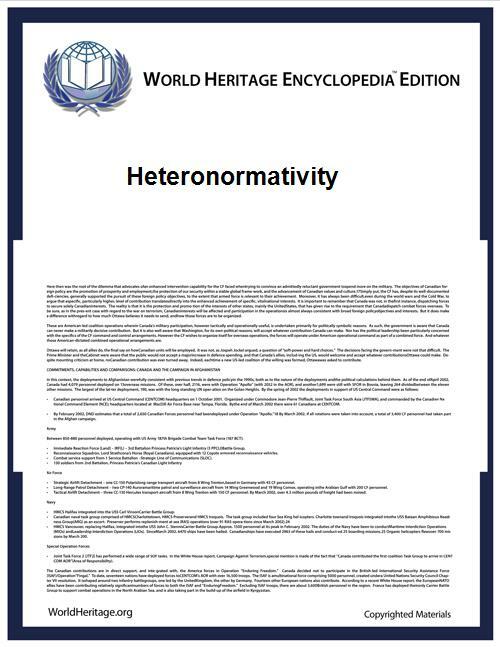 Heteronormative culture "privileges heterosexuality as normal and natural" and fosters a climate where LGBTQ are discriminated against in marriage, tax codes, and employment. Following Berlant and Warner, Laurie and Stark also argue that the domestic "intimate sphere" becomes "the unquestioned non-‐place that anchors heteronormative public discourses, especially those concerning marriage and adoption rights". ^ Coleman, M., Ganong, L. H., & Goodwin, C. (1994). "The presentation of stepfamilies in marriage and family textbooks: A reexamination". Family Relations 45, 289–297. ^ Griffin, Penny. "Sexing the Economy in a Neo-liberal World Order: Neo-liberal Discourse and the (Re)Production of Heteronormative Heterosexuality." British Journal of Politics and International Relations 9.2 (2007): 220–238. Academic Search Premier. EBSCO. MCTC LIBRARY. 30 June 2009.